There are legitimate reasons why tea tree oil deserves to be in your medicine cabinet. For those who don’t know, tea tree oil is an essential oil, also known as Melaleuca alternifoliais, and is a natural extract from a plant that is native to Australia. For decades, people from all over the world have relied on tea tree oil to heal various ailments. The oil is inexpensive and easy-to-use, and provides plenty of benefits to its users. Although tea tree oil has gained a classic reputation of providing remedies to several health ailments, this essential oil is primarily known for its topical antiseptic and anti-fungal treatment. Due to its antibiotic properties, this oil helps in combating common skin ailments such as acne, dandruff, rashes, and so forth. Below mentioned are the 5 best ways to get better tea tree oil skin. Studies have proven that tea tree oil is as effective as, let’s say, benzoyl peroxide, to reduce acne. In fact, tea tree oil is a seamless, natural alternative for curing acne, without causing any side-effects such as skin rashes or inflammation. If you have oily skin that is susceptible to developing acne more often, ensure that you use tea tree oil in your treatment. There are many individuals with dry skin, relying heavily on tea tree oil to cure their skin ailments. All you need to do is add five spoons of tea tree oil to one spoon of almond oil. Then, gently massage the mixture onto the skin. Leave the mixture for some time and rinse off the application with warm water. Regular application of tea tree oil will help in keeping your skin hydrated and leave your skin feeling soft and radiant. All in all, tea tree oil does a fantastic job in healing all types of skin infections. This particular oil can be used as an effective anti-fungal and anti-viral home remedy, thereby helping in curing athlete’s foot and other fungal infections. Besides, tea tree oil also contains antiseptic properties, helpful for treating wounds, burns and boils. Remember to dilute the tea tree oil in water before applying it over the affected areas. Aging is an inevitable process, and none of us are fully immune to it. However, we can always slow down the aging process by using effective methods. Tea tree oil, for instance, is a wonderful way to prevent premature signs of aging. Simply dab a few drops of tea tree oil on a clean cotton swab and apply it all over your facial skin. Or, you could apply a face wash or face gel that contains tea tree oil in them. If you fancy a younger and radiant skin, tea tree oil is your best bet! Tea tree oil is known (and, rightfully so) as ‘Medicine in a bottle’, as it has the properties to heal all types of skin disorders. This particular oil can cure chapped lips too. You can also apply undiluted tea tree oil onto your warts, but be sure you don’t have a sensitive skin. Apply it twice a day and warts will disappear. Even for healing wounds and ringworms, you can turn to tea tree oil. Don’t make a mistake of ingesting tea tree oil! It’s supposed to be topically used. Benefits of tea tree oil on the skin are plenty, and in case if you are wondering if it’s safe to apply tea tree oil, then the answer is yes. As long as the oil is applied topically and in appropriate doses, there is nothing to worry. Author Bio: Amanda Dawson is a fitness coach and health writer. She advocates promoting personal hygiene among athletes, besides this she contributes for various online health publications that mainly cover health guides, fitness and yoga. 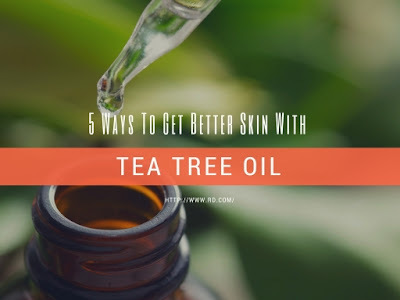 Tee Tree Oil (TTO) is quite strong and usually burns quite a bit when applied directly to the skin.I usually mix a few drops of TTO and a few drops of Witch Hazel in the palm of my hand and then use a Q-Tip to apply it to the area needed. For larger areas, I would wet a washcloth and then pour a few drops of TTO on one corner, squeeze it out a little to mix the water and TTO and then use that corner of the washcloth over the area needed. Tea tree oil is good for the skin. Most people use it for various things such as to stop cold sores, to put on cuts and you can buy hair conditioner to prevent hair lice. If you suffer from sweaty feet you can put some of the tea tree oil onto your feet before putting on your foot wear. Tea tree oil has proven to be a very powerful anti-bacterial and anti-fungalt it has been proven effective killing acne bacteria when topically applied. And because of that it is often used as a replacement to benzoyl peroxide in many of the "natural" acne treatments.